Encontrei 11 Hotéis em Whiteside. Escolha a data de entrada e saída para ver os hotéis disponíveis em Whiteside. Sem informar as datas, os preços com (*) são preços médios de cada hotel e nos arredores até uma distância de 10 km. Set in Whiteside, 26 km from Brisbane, Berry Good Retreat features air-conditioned accommodation and free private parking. The room features full kitchen facilities, including a coffee machine, and a private balcony with seating and a BBQ. Petrie is 4 km from the property, Dayboro is 16 km, Mount Mee is 20 km while Redcliffe is 18 km away. The nearest airport is Brisbane Airport, 24 km from Berry Good Retreat. Situated in Petrie in Queensland, this detached holiday home is 30 minutes' drive north of Brisbane. The property features views of the garden. Free WiFi is provided throughout the property and free private parking is available on site. There is a living room with a flat-screen TV and a complete kitchen. There is a private bathroom with a shower. The nearest airport is Brisbane Airport, 25 minutes' drive from the property. It is within walking distance of a supermarket and a pub. There is a public swimming pool 5 minutes' away in Lawnton. There are many excellent golf courses in the surrounding areas. Offering an outdoor pool, The Huntington Villas is located in Warner, 21 km from Brisbane CBD, the airport is 19 km away. Margate is 17 km from the property. Free private parking is available on site. The accommodation comes with a flat-screen TV. All units include a kitchen fitted with a dishwasher and oven. A microwave and kettle are also provided. Bed linen is featured. Redcliffe is 17 km from The Huntington Villas, while Springwood is 40 km away. Offering an outdoor pool, year-round outdoor pool and barbecue, Kallangur Motel is situated in Kallangur, 12 km from Brisbane Entertainment Centre. Free private parking is available on site. Certain rooms feature a private bathroom with a spa bath, while others have free toiletries and a hair dryer. You will find a kettle in the room. Kallangur Motel features free WiFi . A TV is offered. RNA Showgrounds is 23 km from Kallangur Motel, while Suncorp Stadium is 24 km away. The nearest airport is Brisbane Airport, 19 km from the property. Located in lovely North Lakes, Liberty Circuit Executive Home offers a modern and spacious 3-bedroom house. Guests enjoy free Wi-Fi and a patio with BBQ facilities and an outdoor setting. Liberty Circuit Home is a 10-minute drive from North Lakes Resort Golf Club. It is a 20-minute drive from Redcliffe and Suttons Beach Leisure Area. Brisbane Airport is a 30-minute drive away. The air-conditioned house features a fully equipped kitchen including an oven, stove and dishwasher. It boasts an open plan dining and lounge area offering a flat-screen TV with cable channels and a DVD player. The bathroom has a bathtub and a shower. There are also laundry facilities. O Mercure Clear Mountain Lodge está localizado no topo de uma montanha e oferece vistas panorâmicas sobre as Montanhas Glasshouse, a 35 minutos do centro da cidade de Brisbane. Possui um spa e uma piscina exterior. Os quartos modernos do Mercure Clear Mountain Lodge estão bem equipados com ar condicionado e televisões com ecrã plasma. Todos os quartos têm varandas privadas com vistas pitorescas para as montanhas circundantes e para as Ilhas Moreton Bay. No Spa Stephanie’s Mountain, os hóspedes podem relaxar com uma variedade de relaxantes tratamentos corporais e de beleza. O tratamento de assinatura do spa é terapia de vinha, inspirado pela própria vinha do Mercure. Os hóspedes podem desfrutar de cozinha gourmet internacional no restaurante do Mercure, o Mandy’s on the Mountain. O Bar Lodge propõe uma variedade de bebidas e dispõe de uma lareira. O Aeroporto de Brisbane fica apenas a 23 km. Offering an outdoor pool and year-round outdoor pool, The Grange villas is situated in Brisbane. Brisbane Entertainment Centre is 9 km from the property. Free private parking is available on site. The accommodation is equipped with a dining area and seating area with a flat-screen TV. There is also a kitchen, fitted with a dishwasher and oven. A microwave and toaster are also offered, as well as a kettle. Towels and bed linen are available. The Grange villas also includes a barbecue. RNA Showgrounds is 16 km from The Grange villas. The nearest airport is Brisbane Airport, 15 km from The Grange villas. Rosies Place is situated in Kallangur, 27 km from Brisbane. Rosies Place features free WiFi throughout the property. Margate is 10 km from Rosies Place, while Caloundra is 49 km away. The nearest airport is Brisbane Airport, 19 km from the property. Offering rooms with free Wi-Fi and an LCD TV with satellite channels, Bald Hills Motel is just 10 minutes’ walk from Bald Hills Train Station. Free parking is available on site. The air-conditioned rooms have a refrigerator, a toaster, a microwave and tea and coffee making facilities. Each room has a private bathroom with free toiletries. Motel Bald Hills is located on the old Gympie Highway, 15 minutes’ drive from Brisbane Entertainment Centre. Brisbane is a 30-minute drive, and Steve Irwin’s Australia Zoo is a 45-minute drive away. Set in Brisbane, this air-conditioned apartment features a terrace. 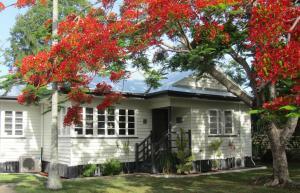 The property boasts views of the garden and is 3.9 km from Brisbane Entertainment Centre. Free private parking is available on site. There is a seating area, a dining area and a kitchenette complete with an oven, a toaster and a stovetop. Towels and bed linen are available in this self-catering accommodation. There is a private bathroom with a shower. RNA Showgrounds is 13 km from Hideaway Cottage, while Story Bridge is 15 km from the property. Brisbane Airport is 10 km away.